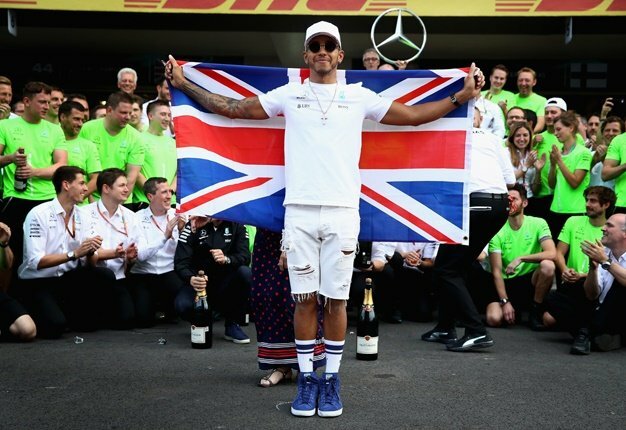 Formula 1 world champion Lewis Hamilton profited from Ferrari's latest failure and won a dramatic Bahrain Grand Prix on Sunday. The race looked likely to finish a Ferrari 1-2 for Charles Leclerc and Sebastian Vettel. But Vettel cracked under the pressure of Hamilton's attack with less than 20 laps left and span out of contention. In a dramatic twist, race leader Leclerc's engine started losing power with less than 10 laps left, allowing Hamilton to shred a 10-second deficit and secure a 1-2 for Mercedes as Valtteri Bottas passed Leclerc with three laps to go. Red Bull's Max Verstappen placed fourth with Vettel in fifth. Heading into the Chinese GP in two weeks' time, Ferrari has to find a way to stop throwing away points. Hamilton's 74th career win earned him a hug from former England and Manchester United star David Beckham. But the five-time F1 champion acknowledged this one came with a touch of good fortune. That's why Hamilton was quick to commiserate with Leclerc, climbing out of his car and sprinting over to him. "That was extremely unfortunate for Charles, he drove a great race," Hamilton said. "He had done enough to win. We were definitely lucky today, but you have to take things as they come." Ferrari had placed 1-2 in all three practice sessions and all three sections of qualifying. But in the past two seasons, the proud Italian manufacturer has made countless errors, and again the team's reliability issues seem a big issue. "It was not our day," Leclerc said, containing his frustration admirably. "Of course I'm extremely disappointed." It looked even more like being Ferrari's day when Hamilton made an unusual error, taking a turn too wide on Lap 20 and slipping more than 6 seconds behind Leclerc. The British driver's clumsy error, and Ferrari's superior speed, meant Vettel was soon on Hamilton's tail and he overtook him on Lap 23 to put Ferrari 1-2 and coasting. To make matters worse, Hamilton was worried about his rear tires, saying over radio "I'm in really big trouble." As it turned out, he needn't have been so concerned, with another Ferrari flop not too far away. Question marks were raised last season and in 2017 about Vettel's repeated mistakes under pressure, particularly when he crashed while leading the German GP last year. This time, he badly miscalculated Hamilton's second attack. Even so, there was no contact from Hamilton and five-time F1 champion Vettel lost control of the car all by himself. It was not Vettel's day. Soon after that, his front wing came off after he touched cars with Williams driver George Russell and Vettel returned to the pits. Then it got worse as panic crept into Leclerc's voice. "Something strange with the engine," Leclerc said as his lead rapidly dwindled. "What's happening?"